B.K.S. 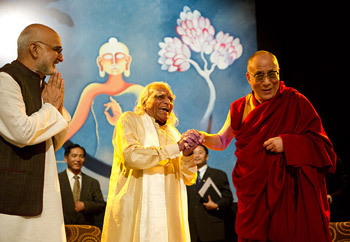 Iyengar with the Dalai Lama at a conference in New Delhi in November, 2010. Click on the photo to read more. Vancouver is a long way from Pune, India, and B.K.S. Iyengar is miles removed from my first Iyengar teacher, who could be fiery when the situation demanded, but was most often gentle and calm. So for the first years of my yoga life, I didn’t feel very connected to this faraway guru, with his habit of hitting people and his demanding, not to say grueling, way of teaching poses. I still wouldn’t say that B.K.S. Iyengar is my guru, although he is my teacher, and more directly, my teachers’ teacher. But he has profoundly changed my life, in ways that I could never have predicted when I took my first classes. So when his birthday comes around, I have to stop and pay my respects. 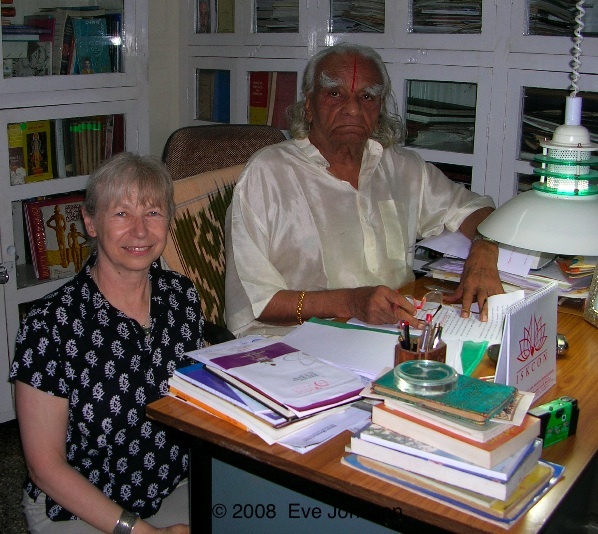 On December 14, Bellur Krisnamachar Sundararaja Iyengar turns 92, and I’m very glad he was born. 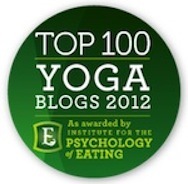 When I took my first Iyengar yoga classes, I was writing about food for a newspaper. Yoga for me was all about fitness, emotional stability, and becoming a better writer by applying what I learned about yoga practice to my writing practice. Years passed. Things shifted. First I realized that I was no longer doing yoga “for” anything. Yes, it made me fit and happy, or at least resilient in the face of challenges. But doing the poses was compelling enough, all by itself. Then writing changed. My writing became a way of communicating the state of mind fostered by my practice – the wisdom of yoga, if you like – without ever having to mention it. Thirteen years after I became a student, I taught my first class. 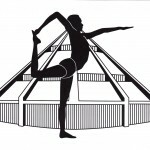 Now I teach Iyengar yoga, and write about yoga practice. What I took to be my unstated philosophical background has become my subject. I think it’s nothing short of magical that this man has changed my life and the lives of millions of other people. As a sickly little boy, in a struggling South Indian Brahmin family, he seemed unlikely to survive, much less become the world’s greatest living yoga master. 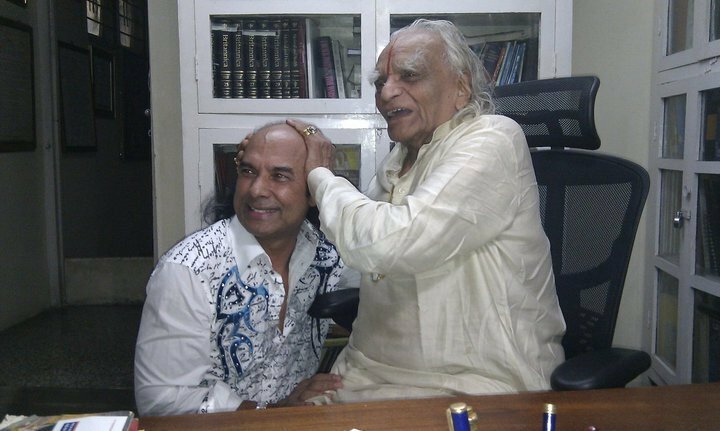 Another notable meeting from 2010: Guruji meets Bikram Choudhary in the library of the Institute in Pune. Iyengar was sent to live with his married older sister when he was 15. It is an astonishing twist of fate that her husband was Sri Tirumalai Krishnamacharya, the root guru for not only Iyengar, but for Ashtanga yoga guru Patabhi Jois. 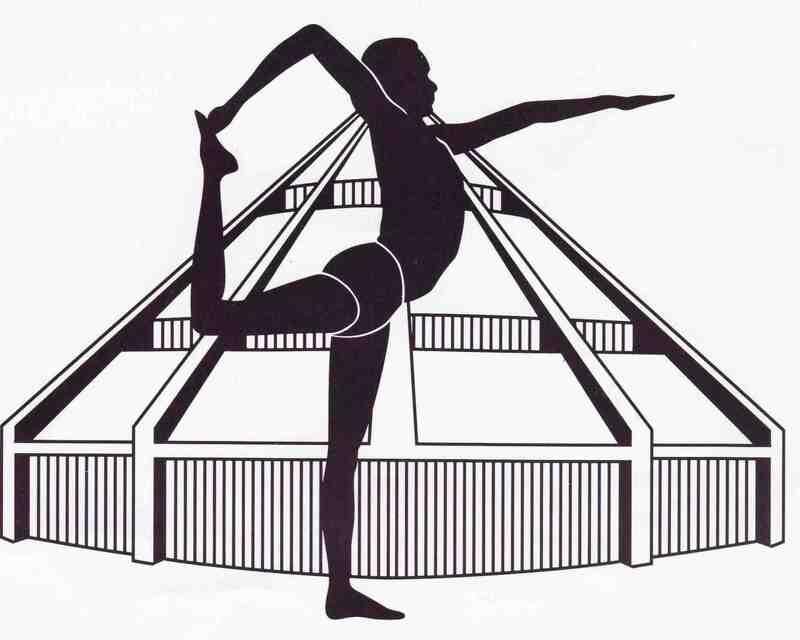 Iyengar became one of Krishnamacharya’s demo boys, teenagers trained to put on demonstrations of the new asana practice he was developing as a homegrown form of physical and mental fitness. You can see a very young Iyengar in that role in the famous 1938 news clip. And while his relationship with his formidable brother-in-law was never warm, Krisnamacharya did send him to Pune to teach in 1937, and thus changed the direction of yoga, and of millions of lives, forever. In Pune, Iyengar began to invent the first iterations of the yoga props we now take for granted, such as blocks, straps and bolsters. He was looking for a way to stop using his own body to support his students and improve their alignment in the poses. The first props, he has said, were pots and pans from the kitchen. Now, at 92, he seems deeply happy, despite the still present ferocity. His old age is one of prosperity and honor. Given the happiness he has imparted to others, that seems only right. What a lovely testament. And great photos too. I am in Mexico warming up to do our assessment Jan 21-23. Think of you as I haul myself into Lolasana etc. It was so nice to read about your journey towards becoming an Iyengar teacher. It must have been quite an experience to study in Pune with Iyengar. I hope to make it to there before he is gone. Thank you for sharing, and happy holidays! !